As an appetizer for my Sicilian dinner I prepared vegetarian meatballs made from fennel and dill, served with a tomato sauce. 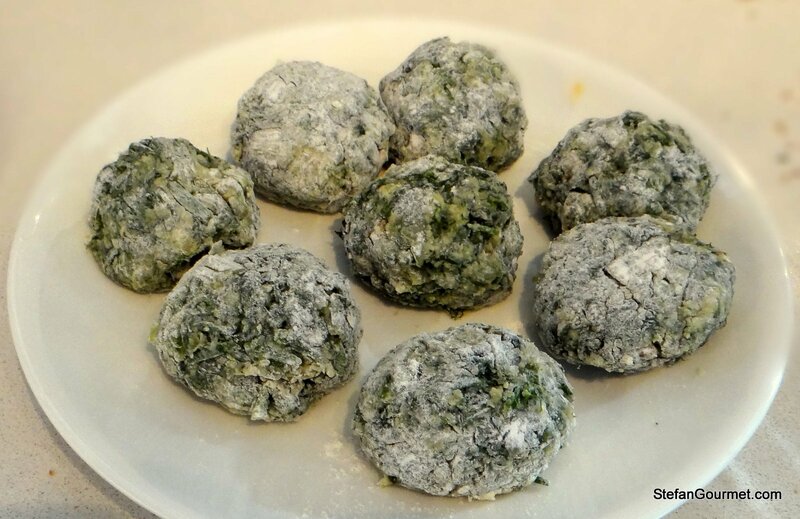 In Italy these polpette di finocchietto are made with wild fennel greens, which grow abundantly in Italy in spring. 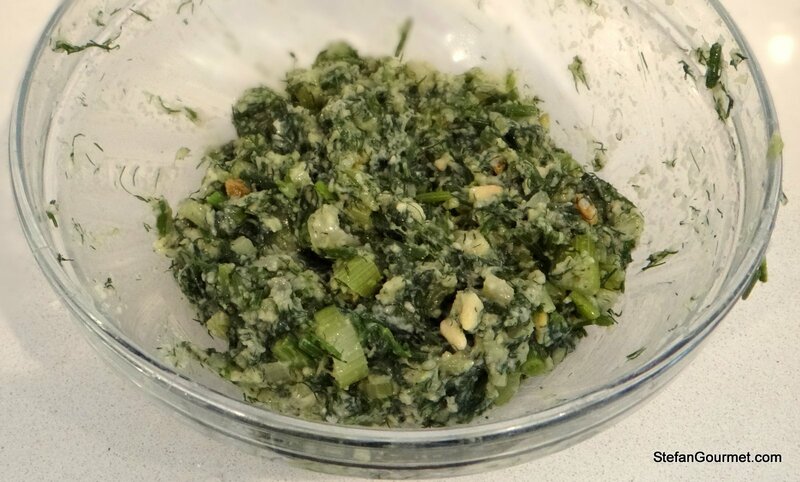 For lack of the wild fennel greens, I decided to use a mixture of fennel fronds (the green stuff on top of fennel bulbs) and dill. We loved the polpette di finocchietto during our wonderful dinner at Tischi Toschi, the best trattoria of Sicily in the port town of Messina. I did not ask for the recipe, so this is my own version. They came out great with a lot of flavor. If you’d like to cook vegetarian, this is also very suitable as a main course. I managed to find some fresh San Marzano plum tomatoes, which are the best Italian tomatoes to make tomato sauce. 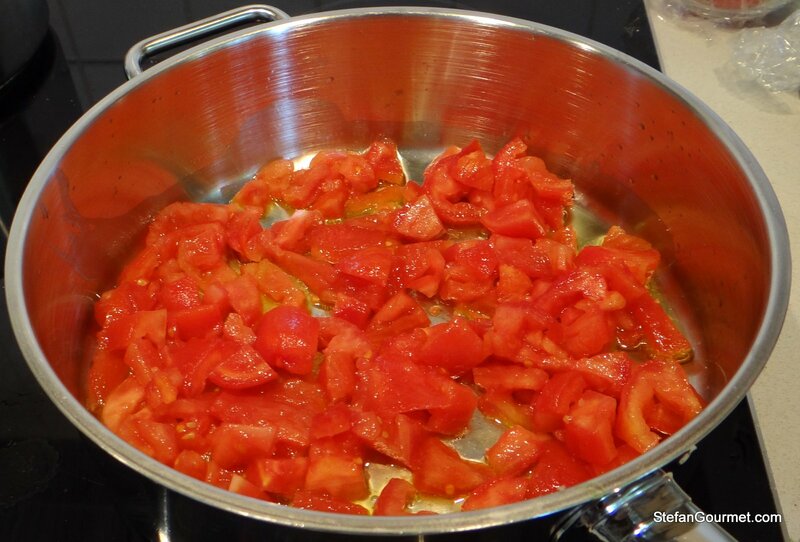 If you can’t find good plum tomatoes, please substitute with good canned tomatoes. Canned San Marzano tomatoes are more expensive than regular canned tomatoes, but with more taste. To get juicy polpette I used fresh breadcrumbs. The drawback was that the meatballs were slightly soft and didn’t keep their shape very well when I fried them. 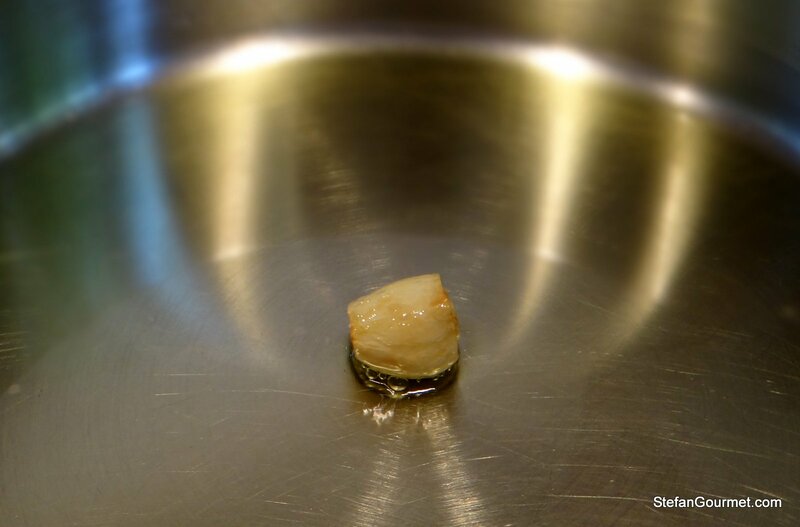 If a round shape is important, you could deep fry the polpette, or use dried breadcrumbs for a firmer texture. 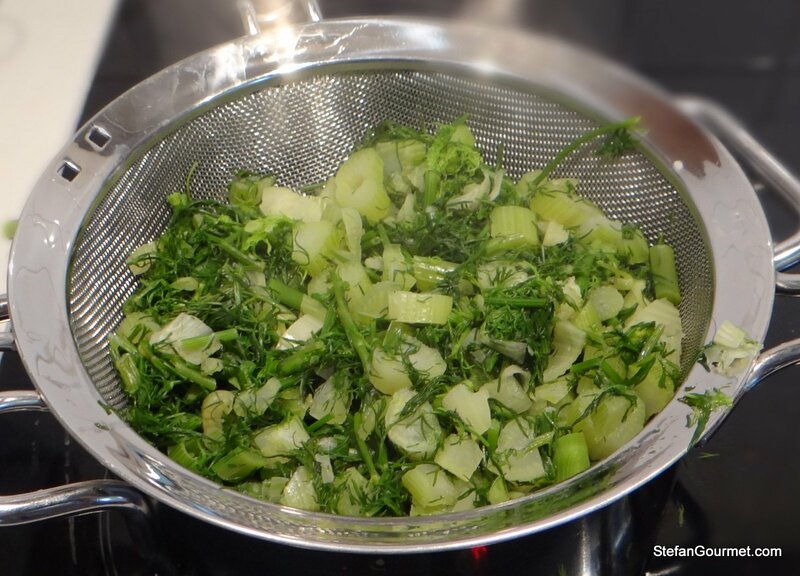 Roughly chop the fennel and dill, separating the thick stalks from the tender greens. Parboil the thick stalks in salted water for 10 minutes. Add the tender greens and parboil for another 5 minutes. 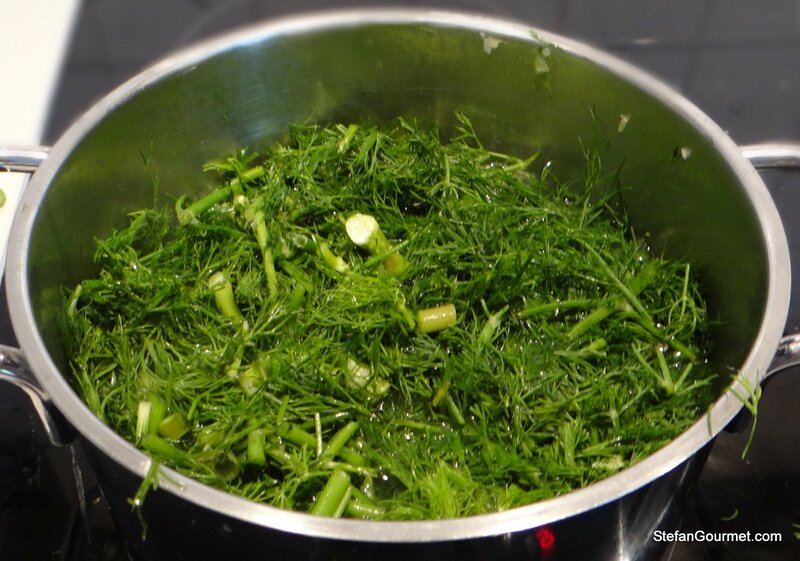 Drain the parboiled fennel and dill and allow to cool. 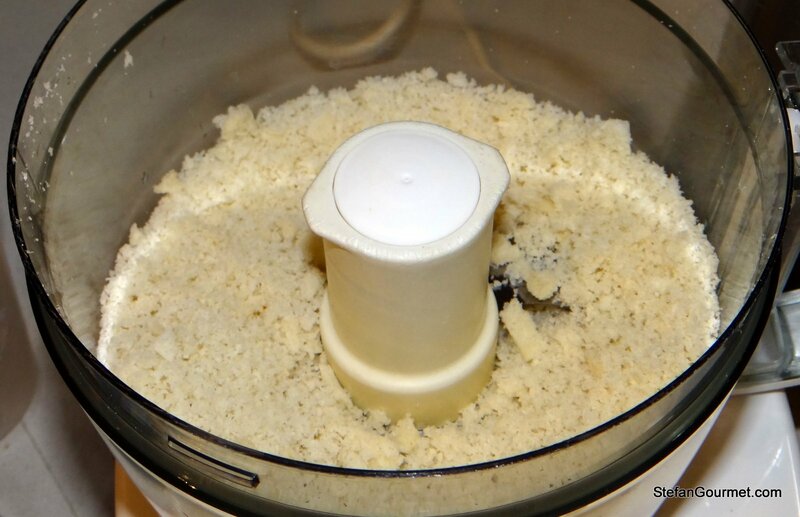 Make the breadcrumbs by grinding Italian or French bread in the food processor. It is okay if the bread if slightly stale. 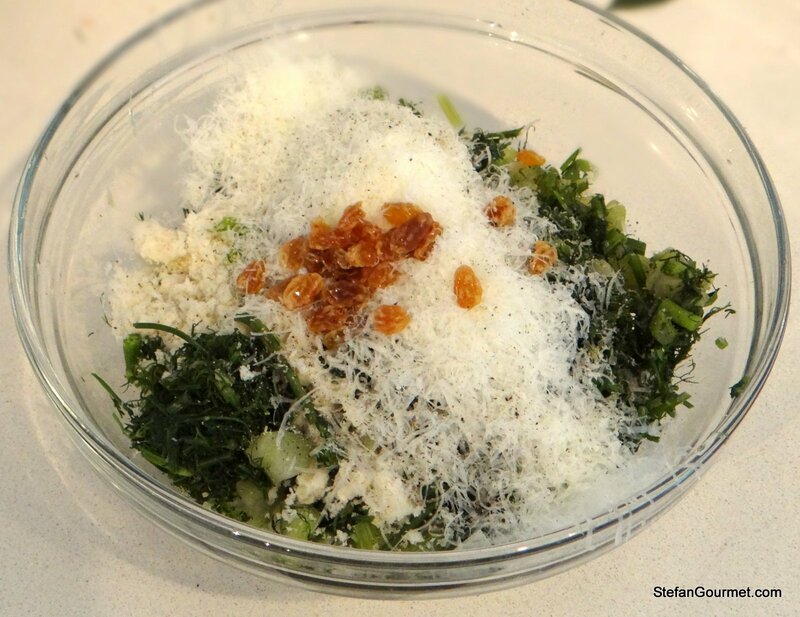 Add parboiled fennel and dill, raisins, pine kernels, breadcrumbs, cheese, salt, and freshly ground black pepper. Mix with your hands. 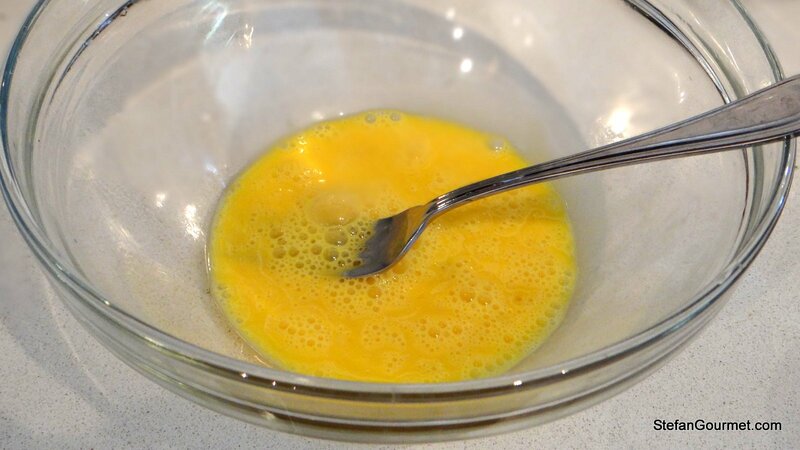 Cover with plastic wrap and allow to firm up in the refrigerator for a few hours. 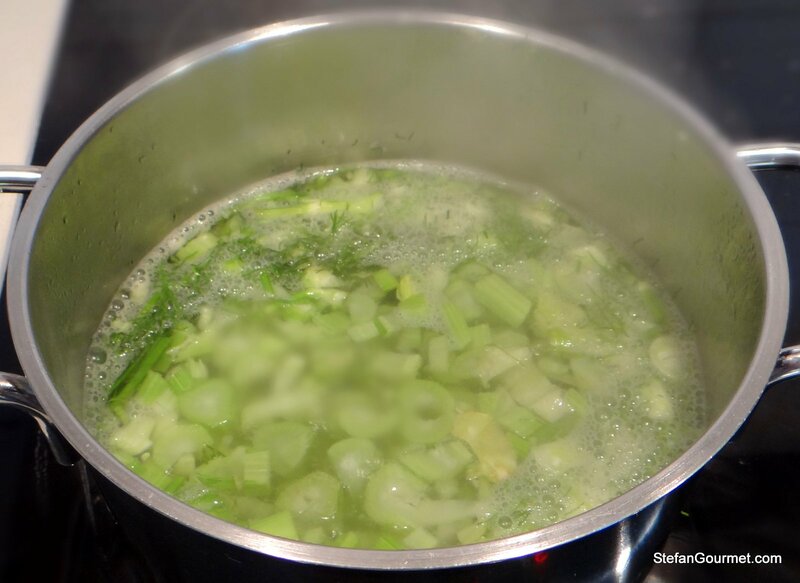 Heat 2 tablespoons olive oil in a frying pan and add the whole clove of garlic, peeled. Sauté the garlic over medium heat until golden on all sides, then discard the garlic. Add the tomatoes. Season with salt and pepper and cook, stirring now and then, over low heat for about 45 minutes or until the tomato sauce has a nice thick consistency. Taste and adjust the seasoning with salt and freshly ground black pepper. Shape the fennel mixture into 8 balls and dust them with flour. 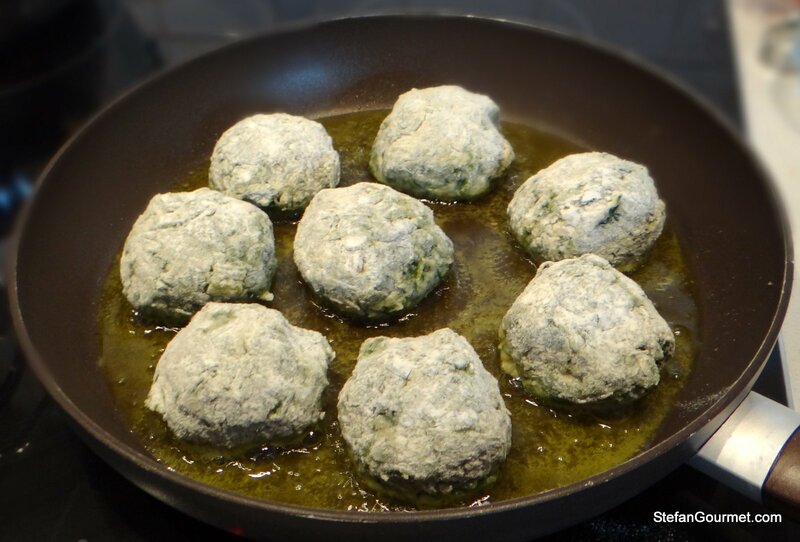 Heat an ample amount of olive oil in a non-stick frying pan and add the polpette. 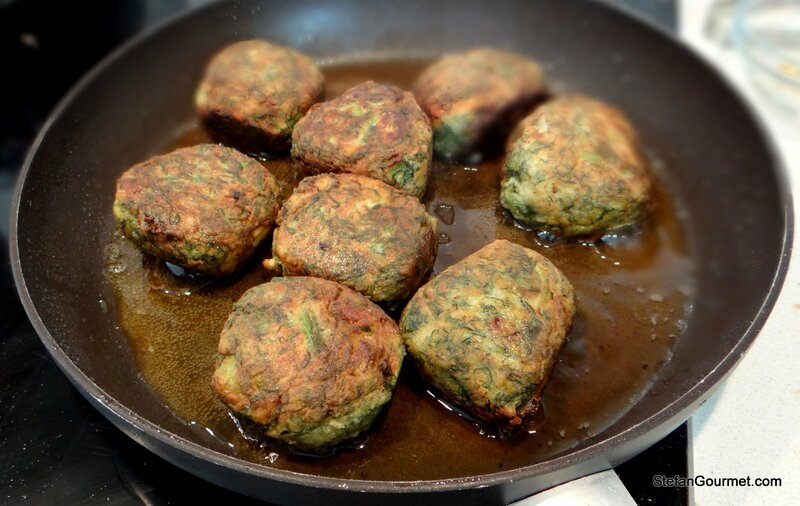 Cook the polpette in the hot oil until they are nicely browned on all sides. Put the browned polpette and the tomato sauce into a saucepan. 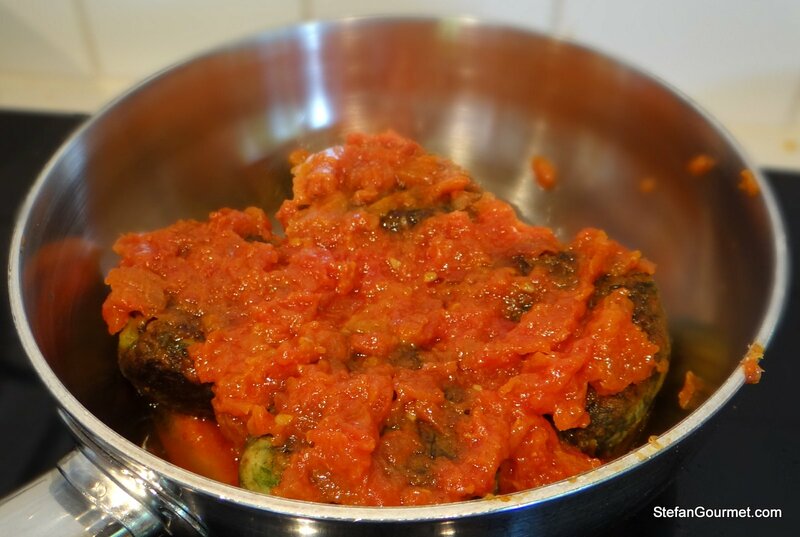 Finish cooking the polpette in the tomato sauce over low heat, stirring gently now and without breaking the polpette. 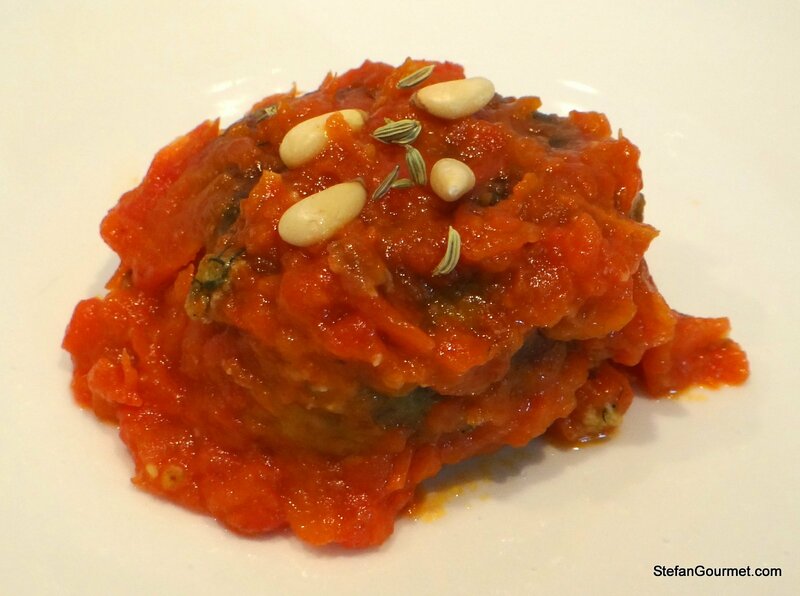 Serve the polpette with the tomato sauce, garnished with pine nuts and fennel seeds. They look very good Stefan. They must have been bursting with flavour. Well, this is the second of your recipes to be copied within a week: the recipe looks and sounds like ‘me’ [what a presumptious statement 🙂 !] and I do have a fennel bulb with a jaundiced eye looking at me every time i open my fridge!! Have the dill . . . shall make the breadcrumbs fresh ‘in spite of’ . . . interesting eating for me and a couple of friends . . . I hope you liked them! 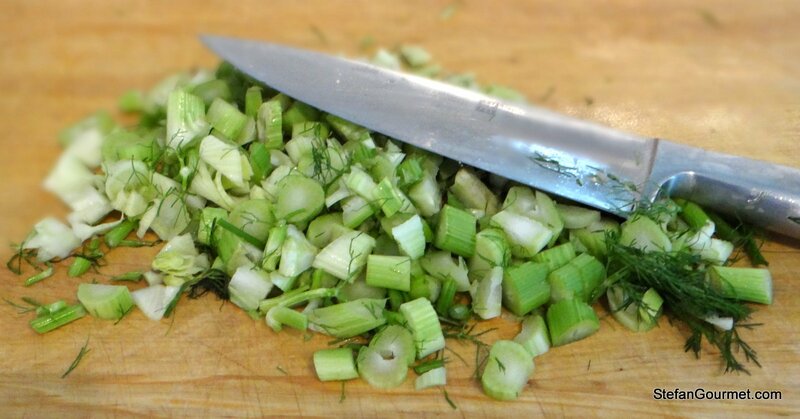 I think I will squeeze out more water from the fennel/dill next time. Yes, I am vegan and am having a Sicilian dinner party tonight as i just spent time traveling the island. Thanks Stefan….check out my blogs of my trip. Will let you know how the cooking goes!! Would love to hear how the dinner went. The photos of your trip are amazing! Thanks, John. There are more Sicily restaurant reviews on my blog that she may like. Especially La Madia is worth a visit if they are into exceptionally fine dining. Grazie mille per i vostri consigli! Mi fa gran piacere. Farò un’altra versione. What a great idea! “fennel croquette” (in Italian “crochetta”) — fantastic! These look wonderful! My boys have never met a meatball they didn’t like so I will be sure to try these. You’re welcome! Thanks for visiting and taking the time to leave such a nice comment. Vegetarian “meatbalsl” with finocchietto. As Italian I love them and yours do sound delicious. I need to try them, hoping to find finocchietto here in Portugal. Thank you for sharing! You are welcome and thank you for leaving such a nice compliment 🙂 I hope you’ll find the finocchietto, or dill and fennel fronds.